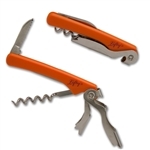 The Left-handed "T" Pattern Corkscrew has a sleek and traditional design. 4-1/4" long by 3-1/2" wide. Spiral is engineered to twist to the left so lefties will find it very easy to use. Designed to screw in counter-clockwise, the direction which is natural and easy for left-handers. Almost impossible for right-handers to figure out, giving it a special appeal for lefties with right-handed friends or housemates. It works very well and seems to be solid enough for years of use. I have not received my order yet. It stated that they tried to deliver but could not. Not sure what that is about! I needed it for December 3rd as it was a birthday present. Very disappointed in the delay. Not sure when it will be delivered. I tried calling UPUS but did not reach anyone.